Truly outstanding sister act... This release strips them down to the basics and gives the listener a real treat in songwriting. The best 5 bucks you could spend today! Go back to the beginning, when it was just a piano, guitar and two undiscovered voices. This stripped down form lends itself to the elegance and power of sister’s, Lily & Madeleine Jurkiewicz, dynamic voices. The beautiful simplicity of acoustic recordings helped the sisters reach viral fame in 2012 and will now be featured on Lily and Madeleine Acoustic Sessions. Like truth, beauty resides in simplicity. When it manifests itself, it doesn’t require elaborate arguments or proofs; you can’t debate someone into apprehending it. It’s apparent and all it requires is appreciation, or perhaps even love. Such are the songs of Lily & Madeleine. All while recording and releasing two albums, The Weight of the Globe EP and Lily & Madeleine LP, touring Europe and the US, the songstress sisters have been recording acoustic versions of their hits. 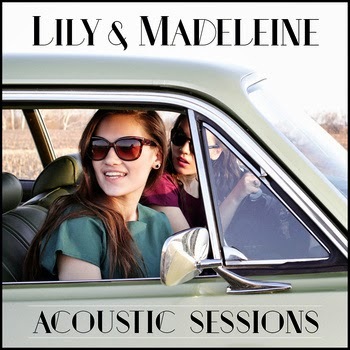 Lily & Madeleine Acoustic Sessions is an intimate reworking of previous tracks and a striking cover of “Sea of Love” by Phil Phillips, popularized by Cat Power. The songs on Lily & Madeleine Acoustic Session trigger profound emotional effects. The shimmering recollections of that summer, that girl, that kiss, the scent of that evening air, the heat of those afternoons, all float in and out of consciousness as these songs play, transporting you to the world inside you that knows everywhere you have been, but that does not know time, or its passage, or its end.